It seems every year the cloud-computing industry reaches a new milestone in both innovation and monetary success. 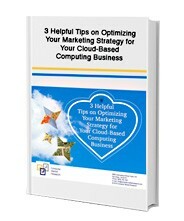 To no one’s surprise, entrepreneurs and small to mid-sized businesses must endure a tenaciously competitive and overwhelming marketplace of heavy hitters and cloud-based dominators with an optimizing SaaS business marketing strategy. But, for one lacks in size and reputation, one makes up in heart, creativity, and determination.